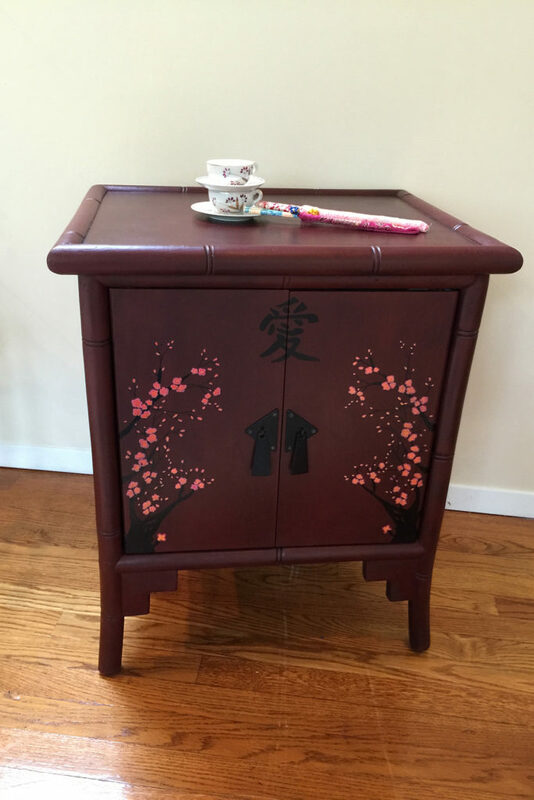 I had an old Pier 1 cabinet and my husband needed a new night stand. 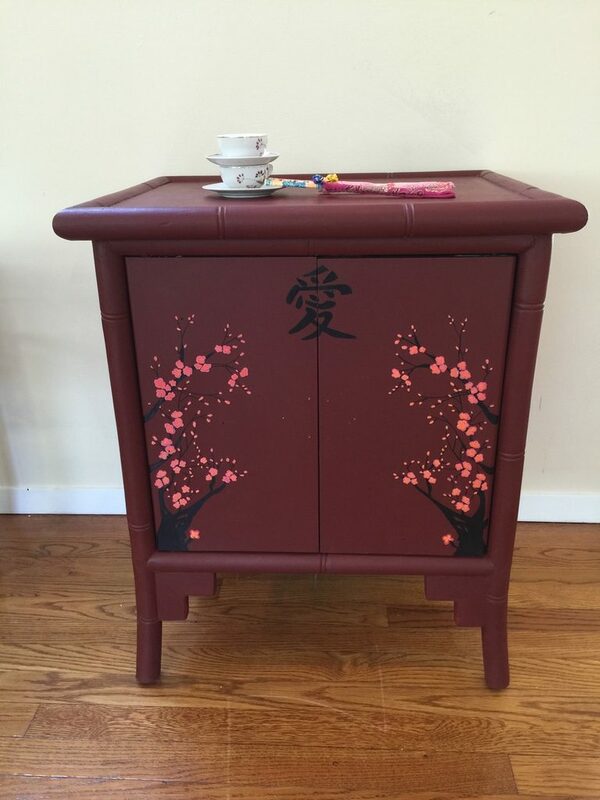 Here was the perfect opportunity to paint, refurbish and reuse. 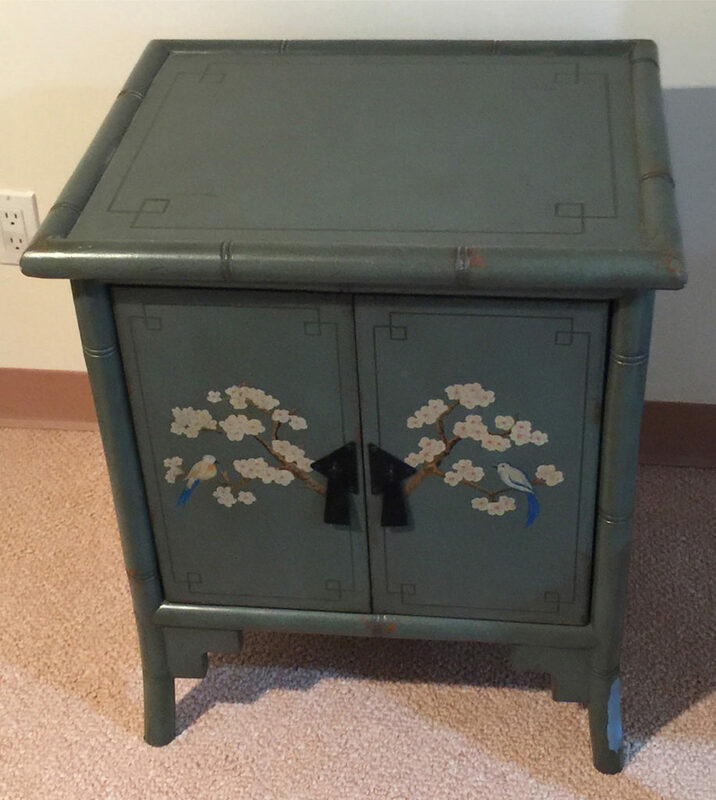 The cabinet had an Asian look and a nice design but the color was boring and some of the paint was chipped. My idea for it was ambitious. Not only would I paint it, I would add a custom design. 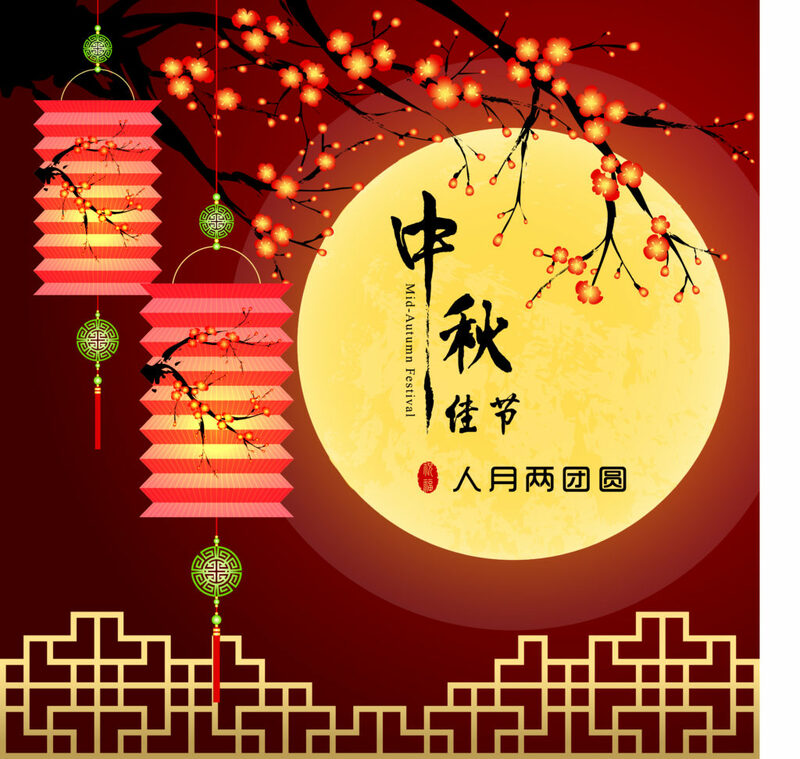 The color it called for was Emperor’s Silk, a beautiful deep red. Even the name sounded Asian. I made it darker, mixing two parts Emperor’s Silk and one part Graphite. 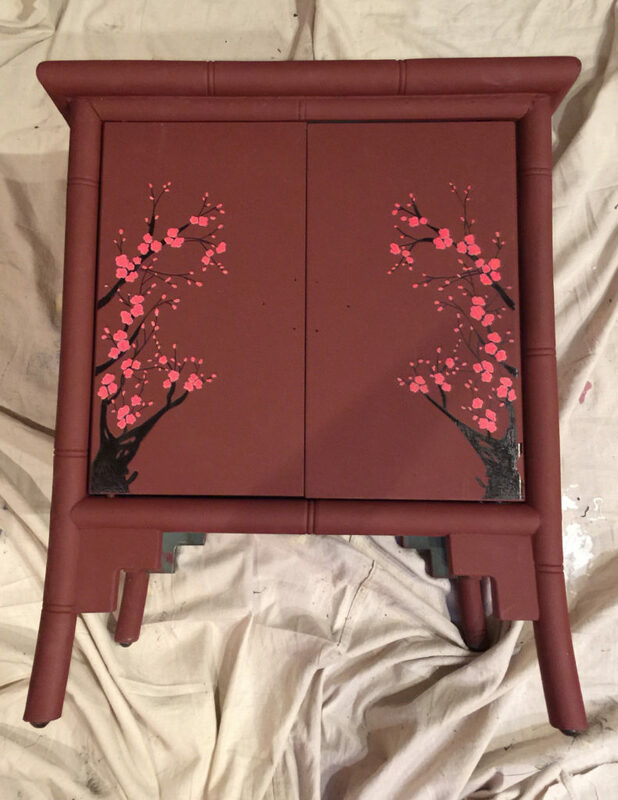 After two coats, it was time to add the decoration. Because I’m not exactly a fine artist, I sat down with my computer and found just the right stock art to buy and copy. It was more complicated than I wanted but I knew I could break it down. I may be middle-aged but I’m no stranger to computers. I’ve been working with them since we used card punches for computer programming. If you’re not familiar with these, click the link and have a laugh. I broke down the image (an Adobe Illustrator file) to the piece I wanted to use and resized the design. I copied and flipped so that I would have two mirror images, one for the right side and one for the left. Because they were taller than the standard 11” paper size, I had to print each of them out on two pages and tape them together. Time to dig out my trusty graphite paper. I used painters tape to attach both the graphite paper and the image. I left a flap so that I could lift both and check my progress. I traced the image on the paper with a sharp pencil. 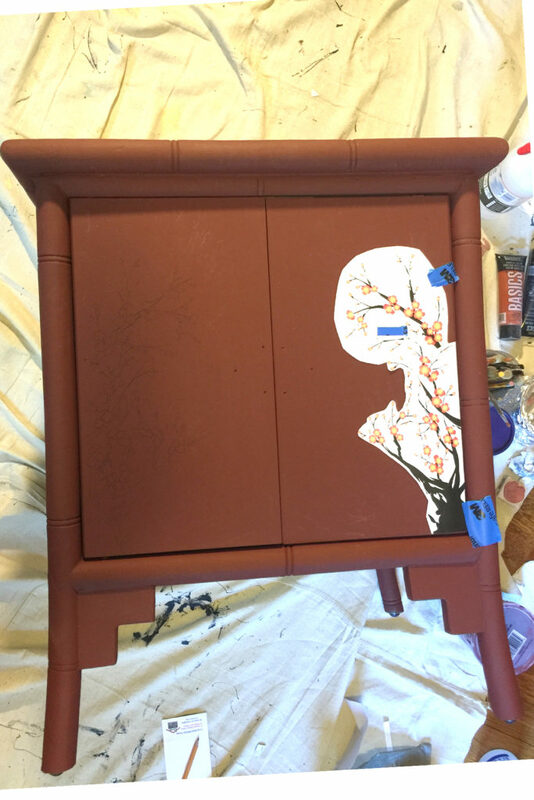 In the image below, you can just about see the transferred outline on the left side. Check your progress. If the graphite paper is upside down you’ll waste time transferring the image onto the back of the paper. Check once in awhile to make sure you didn’t miss a spot. Once I had the outline transferred, I used paint pens to color in the lines. I was like Kindergarten, only a little more nerve wracking. Paint pens are good for smooth lines and color but, being oil-based, they are not as forgiving as crayons. I wasn’t too worried about the details. A rough rendering of the flowers, for instance, would be pretty enough. When I was finished, the front seemed like it had too much blank space. I added, using the same print and trace method, the Chinese symbol for love, borrowed from Google images and checked by Google translate. Those of us who have dropped a pile of carefully ordered pile of 1980’s card punches never take Google for granted. With a sigh of happiness, I applied a coat of clear wax. The result was good but not great. 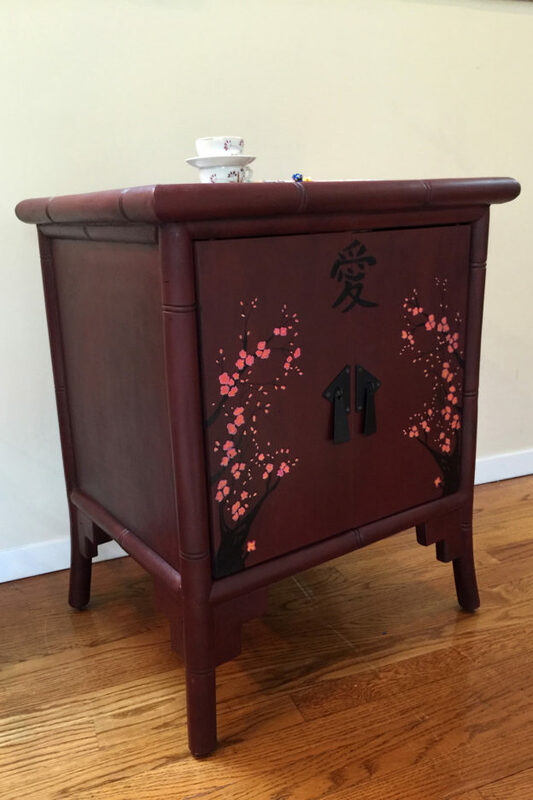 It needed a coat of dark BLACK wax and I applied it hesitantly, hoping it wouldn’t take the pop out of the design. No worries. 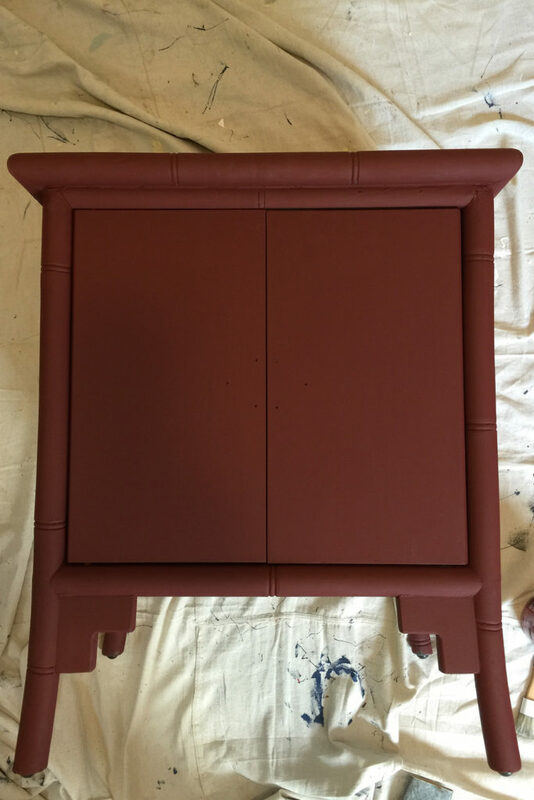 Not only did the dark wax create more depth, but it settled in the grooves of the faux bamboo edges and showed it off very nicely. I didn’t have to do a thing to the knobs from the original piece (except not lose them). They were perfect. Go easy with the paint pens. Mistakes are hard to correct. Use a gentle touch with the side of the nib. Waxing over paint pens is not a problem. 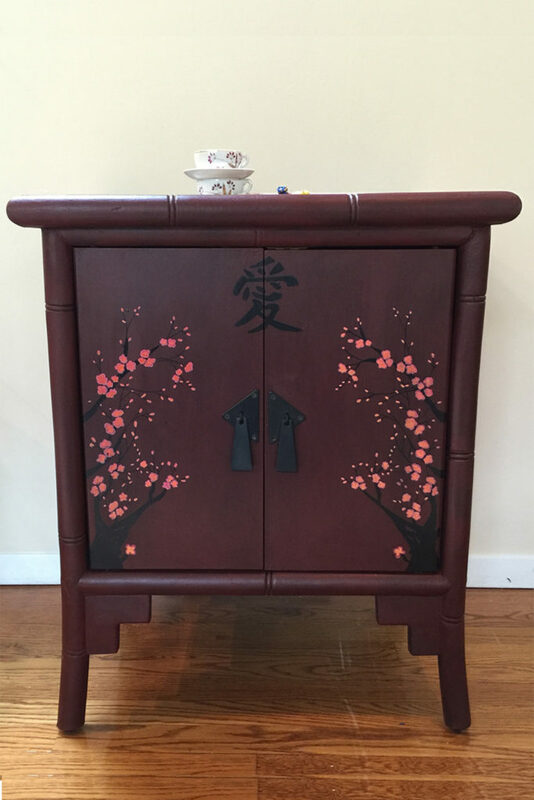 This entry was posted in Furniture, Musings and tagged Annie Sloan, chalk paint, craft, crafting, Emperor's Silk, furniture, Karen Rae Levine, paint, painting, refinish, refinishing, refurbish, refurbishing, repurpose, repurposing, stain, staining, Suite Pieces on October 28, 2016 by Karen Levine.